A decision is pending in the city’s crosswalk protest case involving a former resident after arguments were heard Tuesday about whether to disqualify the judge on the case. 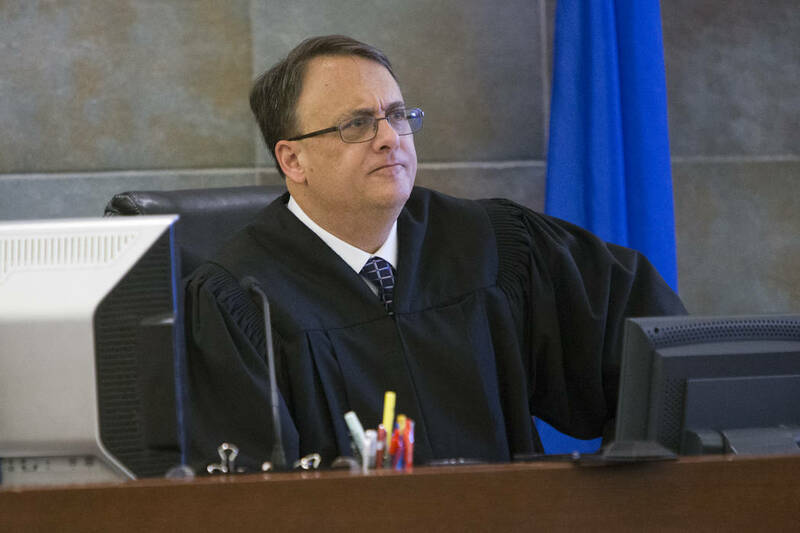 District Judge Richard Scotti as seen at the Regional Justice Center in Las Vegas in 2017. On Tuesday, Dec. 4, Judge Linda Marie Bell heard arguments from the city and Stephen Stubbs, the attorney for John Hunt, about the city’s motion to disqualify Scotti, which was filed on Nov. 7. The city alleges he did not follow the correct procedure. The city sought to negate District Court Judge Richard Scotti’s Oct. 29 written order that said it vindictively prosecuted former Boulder City resident Hunt, who was arrested June 8, 2016, after repeatedly walking back and forth in a marked crosswalk to protest a police-sanctioned enforcement event. Scotti also dismissed the case, ruling it a violation of the First Amendment. City Attorney Steve Morris told Bell they believed there was an overarching procedural issue in the case, as the initial appearance did not occur, the arraignment did not occur and a briefing schedule did not occur. Stubbs also had appeared before Scotti at a status check for transcripts Sept. 19 without the city’s counsel present. Morris said the city received notice that the status check was going to be in chambers and it did not need to be there. In a separate court document, Stubbs said Scotti called the case after noticing him in the gallery Sept. 19. He also said everything that occurred in open court was “scheduling and administrative in nature,” which is allowed per Nevada judicial code. “I did not receive notice not to show up that day,” Stubbs said. He also argued the city’s motion to disqualify Scotti was untimely because it could have been filed earlier. “You can’t go through the case and then say you don’t like the outcome,” he said. “I think there’s a basic concern when one side is there and the other isn’t aware,” Bell responded. Stubbs said nothing substantive was discussed at the hearing. It was all administrative. Morris said the city did file a motion. According to court documents, a motion to set arraignment, initial appearance and the trial was filed by the city Oct. 9. In it, Morris outlined the city’s concerns with the Sept. 19 status check. He also said Scotti’s “absolute failure” to follow court procedures caused a clear bias against the city. He said Scotti basically gave up the court’s authority by allowing Stubbs to dictate how to proceed. Bell said the usual procedure is that prior to hearing any motions there would be an arraignment. Stubbs also said Scotti’s law clerk did tell him the title of the minute order that gave away the results, but she did not give him any other details of the case. Morris argued that there was no final judgment filed from Hunt’s trial in Boulder City Municipal Court so the appeal should not have occurred. Stubbs said Nevada law allows a defendant to appeal from a verdict or a final judgment, and that Hunt was appealing the guilty verdict Judge Margaret Whittaker issued from the bench Aug. 14. At the end of Tuesday’s hearing, Bell took the motion under advisement and said she would issue her decision soon. “The city attorney’s office appreciates the opportunity to present the our arguments to Judge Linda Bell in a properly noticed and conducted hearing. We look forward to receiving Judge Bell’s decision on the city’s motions,” the city said in a statement. When Stubbs brought up Morris and the vindictive prosecution during the hearing, Bell told him that was not part of the motion. A status check is set for 9 a.m. Tuesday, Dec. 18. A decision on the motion is expected.